The popular blog-tracking site technorati.com reports the existance of well over one hundred million blogs. Despite the medium's ubiquity, the impact of political blogging on politics and civic engagemment has not been systematically examined. In an era of depressed civic engagement, where access to the media by common citizens is limited, blogs have the power to change the political landscape. Blogging the Political catalogs the individuals engaged in political blogging, explains why they started blogging, and examines what they hope to gain from it. The larger question at hand is whether and how political blogging facilitates civic engagement and mobilization in the United States. Do political bloggers participate in politics only through blogging or also through more traditional activities such as voting or sending an email to an elected official? Do they encourage their readers to undertake political activities, and how do they go about doing so? 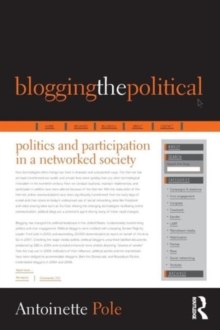 Examining the activity of a diverse spectrum of bloggers, Pole concludes that blogging is indeed a new and important form of political participation, one that can potentially transform politics and lead to increased civic engagement.